Belgian Ageing Studies. 10 jaar onderzoek voor en door ouderen (2015). Editors: Dominique Verté en Nico De Witte. 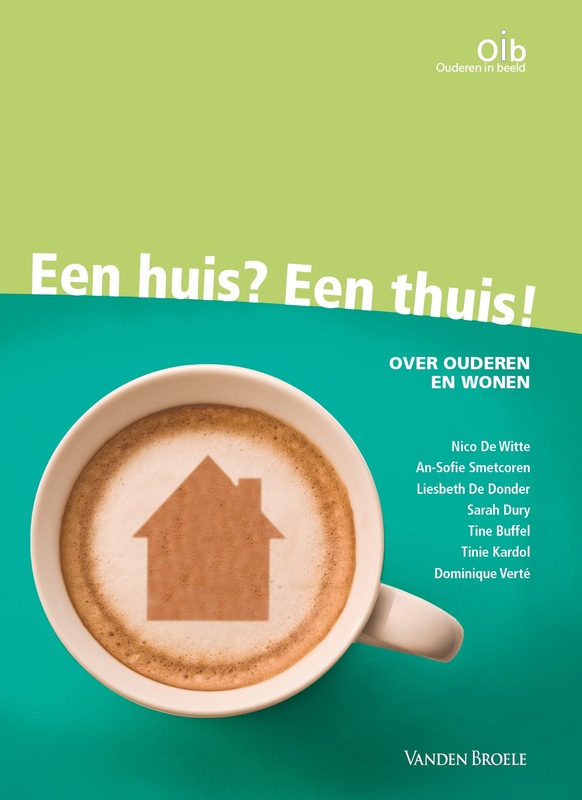 Authors: Nico De Witte, Liesbeth De Donder, Sarah Dury, An-Sofie Smetcoren, Dorien Brosens, Tine Buffel, Eva Dierckx en Dominique Verté. 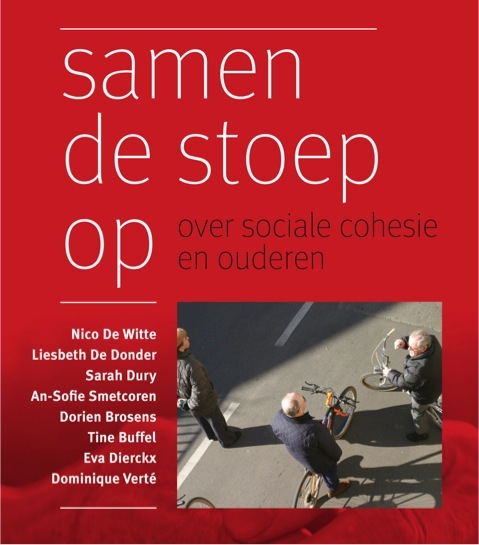 Authors: Nico De Witte, An-Sofie Smetcoren, Liesbeth De Donder, Sarah Dury, Tine Buffel, Tinie Kardol en Dominique Verté. This publication can be ordered on the website of the publisher Vanden Broele. Doe mee! Over ouderen en maatschappelijke participatie (2011). This publication can be ordered on the website of the Province of West Flanders. Klaar? Actie! Over ouderen en cultuurparticipatie (2010). This publication can be ordered on the website of publisher Vanden Broele. Schaakmat of aan zet? Monitor voor lokaal ouderenbeleid in Vlaanderen (2007). 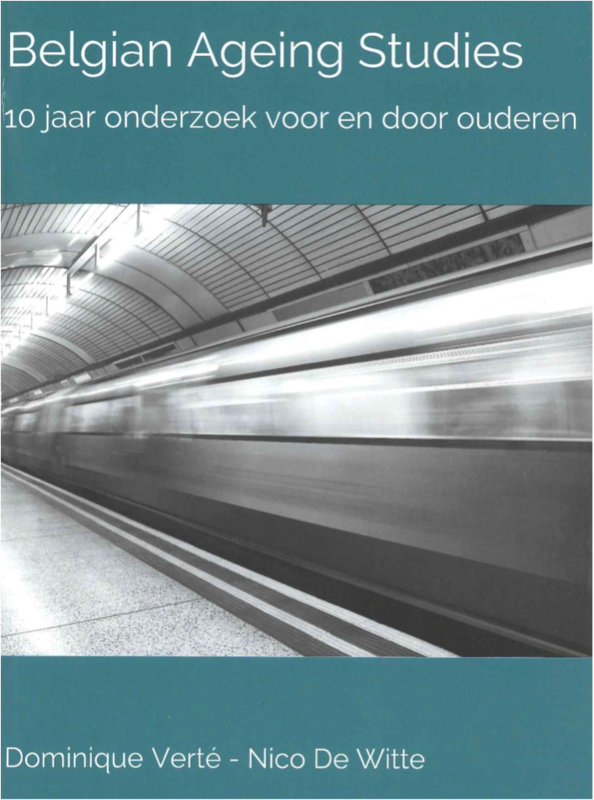 This publication can be ordered on the website van uitgeverij Vanden Broele. Dury, S., De Donder, L., De Witte, N., Brosens, D., Smetcoren, A.-S., Van Regenmortel, S., & Verté, D. (2016). Is volunteering in Later Life impeded or stimulated by other activities? Research on Aging, 38(1), 51-75. Brosens, D., De Donder, L., Dury, S., & Verté, D. (2015). Barriers to participation in vocational education among prisoner. Journal of Prison Education and Reentry, 2(2), 8-22. Brosens, D., De Donder, L., Dury, S., & Verté, D. (2015). Building a research partnership in a prison context: From collaboration to co-construction. Sociological research online, 20(3). Doi:10.5153/sro.3693. Brosens, D., De Donder, L., Dury, S., & Verté, D. (2015). Participation in prison activities: An analysis of the determinants of participation. European Journal on Criminal Policy and Research. Doi:10.1007/s10610- 015-9294-6. Brosens, D., De Donder, L., Vanwing, T., Dury, S., & Verté, D. (2015). Life long learning: The prison library as a bridge to participation. Procedia – Social and Behavioral Sciences, 191, 1496-1500. Buffel, T., McGarry, P., Phillipson, C., De Donder, L., Dury, S., De Witte, N., Smetcoren, A.-S., & Verté, D. (2015). Developing Age-Friendly Cities: Case Studies from Brussels and Manchester and Implications for Policy and Practice. In F. G. Caro, & K. G. Fitzgerald (Eds. ), International Perspectives on Age-Friendly Cities. New York: Routledge. De Donder, L. (2015). Evidence-informed programmes to reduce violence: preventing elder abuse. In Donnelly, P. D., & Ward, C. L. (Eds.). Oxford Textbook of Violence Prevention: Epidemiology, Evidence, and Policy (pp. 207-212). Oxford: Oxford University Press. De Donder, L., De Witte, N., Brosens, D., Dierckx, E., & Verté, D. (2015). Learning to detect and prevent elder abuse: the need for a valid risk assessment instrument. Procedia-Social and behavioural Sciences, 191, 1483-1488. De Donder, L., De Witte, N., Dury, S., Buffel, T., Brosens, D., Smectoren, A.S., Verté, E., Van Regenmortel, S., & Verté, D. (2015). Feelings of unsafety among older people: psychometric properties of the EFU-scale. Procedia-Social and behavioural Sciences, 191, 1095-1101. Dury, S., De Donder, L., De Witte, N., Buffel T., Jacquet, W., & Verté, D. (2015). To volunteer of not: the influence of individual characteristics, resources, and social factors on the likelihood of volunteering by older adults. Nonprofit and Voluntary Sector Quarterly, 44(6), 1107-1128. Brosens, D., De Donder, L., Vanwing, T., Dury, S., & Verté, D. (2014). Lifelong learning programs in prison: influence of social networks on participation.Procedia Social and Behavioral Sciences, 116, 518-523. Buffel, T., De Backer, F., Peeters, J., Phillipson, C., Romero Reina V., Kindekens, A., De Donder, L., & Lombaerts, K. (2014). Promoting sustainable communities through intergenerational practice. Procedia-Social and behavioural Sciences, 116, 1785-1791. Buffel, T., De Donder, L., Phillipson, C., De Witte, N., Dury, S. & Verté, D. (2014). Place Attachment Among Older Adults Living in Four Communities in Flanders, Belgium. Housing Studies, 29, 6, 800-822. Buffel, T ., De Donder, L., Phillipson, C., Dury, S., De Witte, N. and Verté, D. (2014). Social participation among older adults living in medium-sized cities in Belgium: The role of neighbourhood perceptions. Health Promotion International, 29, 4, 655-668. Buffel, T., McGarry, P., Phillipson, C., De Donder, L., Dury, S., De Witte, N., Smetcoren, A.S., & Verté, D. (2014). Developing Age-Friendly Cities: Case Studies from Brussels and Manchester and Implications for Policy and Practice. Journal of aging & social policy, 26, 52-72. De Donder, L., Brosens, D., De Witte, N., Buffel, T., Dury, S., Smetcoren, A.S., & Verté, D. (2014). Lifelong learning in old age: results from the Belgian Ageing Studies. Procedia-Social and behavioural Sciences, 116, 513-517. De Donder, L., De Witte, N., Verté, D., Dury, S., Buffel, T., Smetcoren, A.S., Brosens, D., & Verté, E. (2014). Developing evidence-Based Age-Friendly Policies: a Participatory Research Project. In Sage Research Methods Cases. De Greef, M., De Donder, L., Kardol, T., Segers, M., & Verté, D. (2014). Strengths for mastering ageing by realizing tools in Europe: Senior learning model. Procedia Social and Behavioral Sciences, 116, 4471-4476. Dury, S., De Donder, L., Buffel, T., De Witte, N., Jacquet, W., & Verté, D. (2014). Volunteer participation in later life: Individual resources of (potential) volunteers. Nonprofit and Voluntary Sector Quarterly, 44(6), 1107 – 1128. Lang, G., De Donder, L., Penhale, B., Ferreira-Alvest, J., Tamutiene, I., & Luoma, M.L. (2014). Measuring Older Adults? Abuse: Evaluation of Formative Indicators to Promote Brevity. Educational Gerontology, 40 (7) 531-542. Van Cauwenberg, J., De Donder, L., Clarys, P., De Bourdeaudhuij, I., Deforche, B., et al. (2014). Relationships between the perceived neighborhood social environment and walking for transportation among older adults. Social science & Medicine, 104, 23-30. Van Cauwenberg, J., De Donder, L., Clarys, P., De Bourdeaudhuij, I., Owen, N. et al. (2014). Relationships of individual, social, and physical environmental factors with older adults' television viewing time. Journal of Aging and Physical Activity, 22, 4, 508-517. Brosens, D. (2013). Participation in prison programmes: Encouraging and discouraging factors. In P. Ponsaers, A. Crawford, J. De Maillard, J. Shapland, & A. Verhage (Eds. ), Crime, violence, justice and social order. Monitoring contemporary security issues (pp. 257-298). Antwerp: Maklu. Buffel, T, De Donder, L., Phillipson, C., Dury, S., De Witte, N. and Verté, D. 2013. Social participation among older adults living in medium-sized cities in Belgium: the role of neighbourhood perceptions. Health Promotion International, 2013, 1-14. Buffel, T., Phillipson, C. and Scharf, T. 2013. Experiences of neighbourhood exclusion and inclusion among older people living in deprived inner-city areas in Belgium and England. Ageing & Society, 33, 1, 89-109. De Donder, L., Buffel, T., De Witte, N., Dury, S. and Verté, D. (2013). Perceptual Quality of the Design of the Neighbourhood: The Relation with Feelings of Unsafety in Later Life. Ageing & Society, 33, 917-937. De Donder, L., Lang, G., Penhale, B., Ferreira-Alves, J., Tamutiene, I., Verté, D., & Luoma, M.L. (2013). Item non-response when measuring elder abuse: influence of methodological choices. European Journal of Pubic Health, 23(6), 1021-1026. De Witte, N., Gobbens, R., De Donder, L., Dury, S., Buffel, T., Schols, J. & Verté, D. (2013). The comprehensive frailty assessment instrument: development, validity and reliability. Geriatric Nursing, 34(4), 274-281. De Witte, N., De Donder, L., Dury, S., Buffel, T., Verté, D. & Schols, J. (2013). A theoretical perspective on the conceptualisation and usefulness of frailty and vulnerability measurements in community dwelling older adults. Aporia: the Nursing Journal, 5(1), 13-31. De Witte, N., Gobbens, R., De Donder, L., Dury, S., Buffel, T., Verté, D., & Schols, J. (2013). Validation of the Comprehensive Frailty Assessment Instrument against the Tilburg Frailty Indicator. European Geriatric Medicine, 4, 248-254. Tamutiene, I., De Donder, L., Penhale, B., Lang, G., Ferreira-Alves, J., & Luoma, M.L. (2013). Help seeking behaviour of abused older women (Cases of Austria, Belgium, Finland, Lithuania and Portugal). Filosofija Sociologija, 24(4), 217-225. Van Cauwenberg, J., Clarys, P., De Bourdeaudhui, I., Van Holle, V., Verté, D., De Witte, N., De Donder, L., Buffel, T., Dury, S. and Deforche, B. (2013). Older adults? transportation walking: a cross-sectional study on the cumulative influence of physical environmental factors. International Journal of Health Geographics, 12, 37. Buffel, T., Dury, S., De Donder, L., De Witte, N., Smetcoren, A.S., De Backer, F., De Mette, T., Lombaerts, K., Peeters, J., Vanwing, T., Brosens, D., & Verté, D. (2012). Achieving social cohesion through intergenerational practice, In H. De Jongh, J. Hindson, & J. Burnell (Eds. ), Nature for care, care for nature (pp. 21 - 23). European Commission, Education and culture DG. Buffel, T., Phillipson, C., & Scharf, T. (2012). Ageing in urban environments: Developing age-friendly cities. Critical Social Policy, 32(4), 597–617. Buffel, T., Verté, D., De Donder, L., De Witte, N., Dury, S., Vanwing, T. and Bolsenbroek, A. (2012). Theorising the relationship between older people and their immediate social living environment. International Journal of Lifelong Education, 31, 13-32. De Donder, L., De Witte, N., Buffel, T., Dury, S., & Verté, D. (2012). Social capital and feelings of unsafety in later life: A study on the influence of social networks, place attachment, and civic participation on perceived safety. Research on Aging, 34, 4, 425-448. De Donder, L., De Witte, N., Dury, S., Buffel, T., & Verté, D. (2012). Individual risk factors of feelings of unsafety in later life. European Journal of Ageing, 9(3), 233-242. De Donder, L., Buffel, T., De Witte, N., Dury, S., & Verté, D. (2012). Perceptual quality of neighbourhood design and feelings of unsafety. Ageing & Society. Ageing & Society, FirstView, 1–21. Van Cauwenberg, J., Clarys, P., De Bourdeaudhui, I., Van Holle, V., Verté, D., De Witte, N., De Donder, L., Buffel, T., Dury, S., & Deforche, B. (2012). Physical environmental factors related to walking and cycling in older adults: The Belgian Ageing Studies. BMC Public Health, 12. Van Cauwenberg, J., Clarys, P., De Bourdeaudhuij, I., Van Holle, V., Verte, D., De Witte, N., De Donder, L., Buffel, T., Dury, S., & Deforche, B. (2012). Relationships between the physical environment and older adults’ walking and cycling behaviours: The Belgian aging studies. Journal of Aging and Physical Activity, 20, S314–S315. Buffel, T.,&Phillipson, C. (2011). Experiences of place among older migrants living in inner-city neighbourhoods in Belgium and England. Diversite Urbaine, 11, 13-37. De Donder, L., Lang, G. et al. (2011). Perpetrators of abuse against older women: a multi-national study in Europe. The Journal of Adult Protection, 13 (6), 302-314. De Donder, L., Luoma, M., Penhale, B., Lang, G., Santos, A.J., et al. (2011). European Map of Prevalence Rates of Elder Abuse and its Impact for Future Research. European Journal of Ageing, 8(2), 129-43. De Donder, L., Verté, D., De Witte, N., Buffel, T., & Dury, S. (2010). Reflections about interventions and strategies on increasing feelings of safety in later life. International Journal of Social Sciences and Humanity Studies, 2, 83-89. De Witte, N., Buffel, T., De Donder, L., Dury, S., & Verté, D. (2010). Care shortages in later life: The role of individual and contextual variables in Belgium. International Journal of Social Sciences and Humanity Studies, 2, 111-118. Dury, S., Verté, D., De Donder, L., Buffel,T., & De Witte, N. (2010). Recruiting older volunteers: Findings from the Belgian Ageing Studies. International Journal of Social Sciences and Humanity Studies, 2, 1-8. Vonck, E., Verté, D., De Donder, L., Buffel, T., De Witte, N., & Dury, S. (2010). Older people and sport: Looking beyond the health perspective. International Journal of Social Sciences and Humanity Studies, 2, 9-16. De Donder, L., Buffel, T., Verté, D., Dury, S., & De Witte, N. (2009). Feelings of insecurity in context: Theoretical perspectives for studying fear of crime in late life. International Journal of Economics and Finance, 1, 1-19.